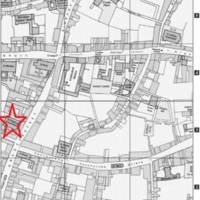 A map with a red star indicating the location of All Hallows Church, Lombard Street - where the set of cuenca seca tiles were found. It is at the intersection of Lombard and Gracechurch Street in the City of London, north of the present-day Monument tube stop. Note: the church is referred to "All Hallows, Gracechurch" in this map. Caroline Barron, London in the Later Middle Ages: Government and People 1200-1500 (Oxford: Oxford University Press, 2004); originally published by the Historic Towns Trust in Mary D. Lobel and W.H. Johns, eds., The City of London from Prehistoric Times to c. 1520, Volume III (Oxford: Oxford University Press, 1989). Historic Towns Trust, “Cuenca Seca Location (Map),” Medieval London, accessed April 22, 2019, http://medievallondon.ace.fordham.edu/items/show/117.